Life probably hasn’t been perfect lately. You’ve gone through a lot with your addiction. Years of binge drinking make drug or alcohol addiction especially difficult. The ups and downs of chronic alcoholism and drug addiction have finally got you beat up pretty badly. You’re taking steps in the right direction, but there’s going to be times where those steps will be hard to get past. You’ll definitely feel hopeful about your recovery process, but there are going to be downsides. The biggest misconception about rehab is that you get progressively better each day. You’ve made it to addiction rehab which is amazing, but the healing process is not linear. There are going to be times when you don’t really want to be going through the rehabilitation process. There are going to be lots of experiences you’ll have in your treatment center that test your strength. You will wake up some days with withdrawal symptoms that make it impossible to feel positive. You will have to confront your mental health issues very explicitly. You will have to think about your abuse and addiction and where things went wrong. You’re going to want to use your drug or alcohol choice very badly. It’s going to feel like the only way to calm you down from the stress. This is especially the case when you’re feeling triggered by something that feels uncomfortable to talk about.Stay patient and stay strong. Whether you realize it during your rehab program or after, there are better ways to ease your pain than to use. There might be certain things that set you off really easily. These things could remind you of painful memories and situations that have hurt you in the past. Let’s explore some ways to avoid relapse triggers as you go through alcohol detox. This will ensure that you get the most out of your experience. More often than not, there is a hidden cause behind why your substance abuse became an addiction. You might not realize at first why things got to the point of addiction, but if you dig deep into the past, there are definitely things that you haven’t been able to confront. It may be something really small, or very traumatic. Those feelings need to be brought to the surface. Those feelings are valid and just. You have to take the time to think about the causation of this abuse and addiction even if it brings you back to bad thoughts. No matter how many treatment options you try, they will not be successful in the long run until you look inward and figure out why you used. 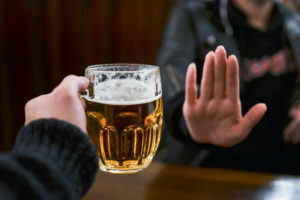 If you can understand why you became so attached to drinking, you will be able to avoid and prevent relapse triggers. When you take the time to understand an issue very well, it becomes less of an issue because you know how to pick it apart. When you can find the root cause of a problem, it’s easier to avoid the problem happening a second time. Many alcoholics and drug addicts over-analyze their addiction and often have heightened anxiety. If you break down your addiction and really ask yourself these questions, you will feel less triggered because you will have already faced your feelings. Get to the bottom of it. Simplify your feelings. Why do you binge drink? What does alcohol provide you with that other coping skills cannot? How are you paying for addiction? What has changed about your life since you went to a rehab center? When you confront things, they become less scary to think about. Realize that you have the power to break down your triggers and understand that they aren't that powerful. You can learn about what bothers you enough to prevent things from causing you to self-destruct. You may even realize that you’ve grown out of some of your triggers as you continue through the process. You’re probably feeling a lot of pressure. You know that you’re in a rehab center to recover. You know your loved ones want you to succeed in your recovery program. You have everything to gain, but it’s going to feel like lots of people are intently looking at your life. Your loved ones expect you to come out of this strong. You expect yourself to come out of this strong. While you want to have a perfect experience and heal quickly, you need to listen to your heart. Be open and honest about your mental health. Take care of yourself first. This will balance you out and make you more emotionally stable. If something is bothering you, speak up about it. Make it a top priority to feel happy and mentally healthy. If you’re in a dual diagnosis treatment center, it’s even more necessary to stay focused on yourself. Participate in a way that feels good. Don’t do anything just because you think your loved ones would want you to. Don’t focus on what your peers will think of your story and addiction. Make your mental health a top priority. Talk about what will make you feel good to express. Talk about drugs and alcohol if you can handle that. Talk about your alcohol abuse if that’s something you want to open up about. While it’s common to want to live up to the expectations of the people around you, you have to go through rehab with your own best interest in mind. Go at your own speed. Addiction and recovery can be a huge relapse trigger itself if you go through it trying to impress people. When you go through the rehabilitation process with a self-care mindset, you will become more mentally stable. When you’re mentally stable, you become more aware of yourself. This self-awareness can lead to a better understanding of your triggers and even help you eliminate which things trigger you. Keep this in mind as you go through rehab. Addiction is a behavioral disorder. If you’re aware of this and work on balancing your thoughts, you avoid becoming easily triggered. Lots of people become very concerned about what’s going on in the “outside world” while they’re at their alcohol and drug rehab. They miss home, social media, and their people. They miss being able to feel like a normal, everyday person. Rehab can feel secluded. This causes them to leave inpatient treatment before they’re actually ready to. They think they’re missing out, and then they get back into the swing of their lives and realize how stressed they are. More often than not, this leads to a quick relapse. The best method of preventing relapse is to stay in rehab until you can verbally say that you are ready to leave. Recovery programs are meant to teach you the tools you need to get through life sober. Similarly to how you don’t fully heal from an illness until you take a full dosage of antibiotics, you won’t be able to heal from addiction until you’ve gone through all the necessary steps. You have to feel ready. To feel ready, you have to be equipped with the right coping skills. You have to be able to understand your own mind and its urges. Drug or alcohol addiction can come back very easily because you’re being opened up to a whole new world. This can be very overwhelming, and it’s better to stay in rehab to learn as much as you possibly can about self-care. There are so many amazing people around you. If you feel like you’re missing out, take a second to bond with the other drugs addicts or alcoholics that are sobering up. Stay with them and learn something new from them. Don’t hold out on following through to the end of rehab just because it’s not where you wanna be. You’ll find a home in your treatment center if you allow yourself to. The thing that people don’t realize about being in recovery, whether or not it’s dual diagnosis recovery, is that it’s so much more about your mental health than your habits. You need to remain patient and allow yourself time to get over your drug and alcohol addiction at a healthy pace. Don’t pressure yourself to feel better and detox quickly. You need to get through withdrawal symptoms and alcoholics anonymous with patience. You need to let your mind grow and learn more about yourself before jumping into sober living. This will avoid triggers entirely. The reason for this is because when you learn more about yourself and your addiction, your triggers won’t be triggers anymore. There will definitely be painful memories, but a smart recovery with patience will remove your desire to use as a defense mechanism. The main point of these tips is for you to realize that your mental health needs time to heal. It takes a lot of willpower to learn a new side of yourself. You need to dig deep into who you are. You need to ask yourself how you got to the point of having to go through substance abuse treatment. You need to face that head-on, and patiently work with yourself to become the best version of yourself. Addiction rehabilitation will address the cause of your drug or alcohol addiction. In the end, this self-awareness and your diligence to stay at the recovery center will help you avoid triggers altogether. You’ll find it harder to justify substance abuse and you will have better ways to calm your stress. You will be good at preventing a relapse because you simply won’t consider substance abuse an option to dealing with your pain.